Our meeting#604 was held at Hatobakaikan and it was a very beautiful sunny day. The meeting started on time at 2pm and today’s TMOD was TM K.T. (me) and at the beginning of the session, I informed the membership that it will be a last chance to conduct the TMOD role before my maternity leave. TM Fujima introduced today’s Word of the day, [fabulously]. 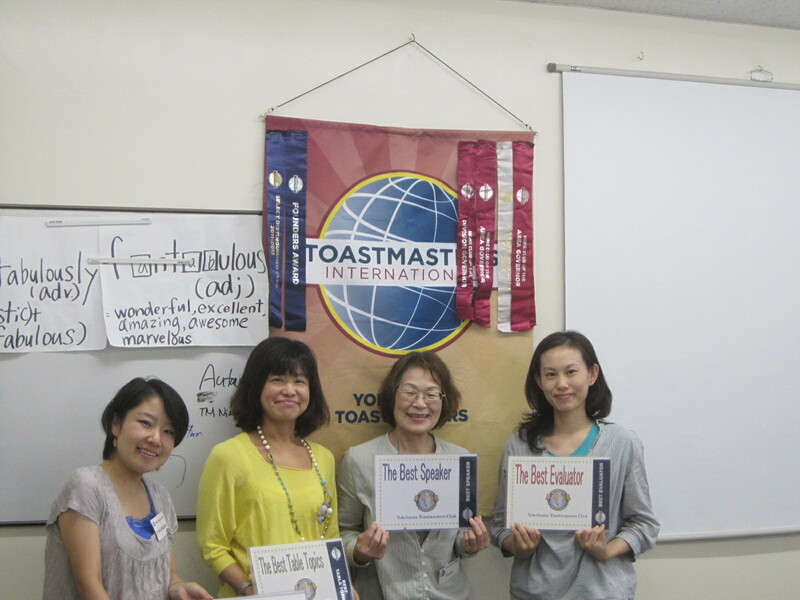 Many members used her Word of the Day several times during the meeting. Today’s Vote Counter was TM G who became our club member on last meeting. Although it was a first role for him, he introduced his role and objective very well. Today’s Table Topic Master was TM C.F who came back to be our member last August and he gave us 5 questions related to Autumn. He ran his session very smoothly. We had 3 speakers, TM R.K and TM T.T and TM A.T. TM T.T gave us a very informative speech about nutrition and the benefits of Soymilk. We learned a lot of useful tips about Soymilk and the differentiation between milk and soymilk. TM A.T made a Japanese speech for the practice session of Japanese Evaluation contest. During the evaluation session, TM H.A gave us 2 evaluation speeches for TM R.K’s speech in English and for TM A.T’s Japanese speech in Japanese. We all enjoyed and learned from her high quality evaluation speech in both languages. Good luck at the Area Contest!! Today’s selected best speakers were all women!!! It became a girl’s day!!! Wow. Congratulation!! At the end of the meeting, one of the today’s guests Ms. M.N indicated her intention to become a Yokohama TM Club official member at her next meeting!! Another good point of today’s meeting was that all attendees had a chance to speak during a meeting. We all enjoyed today’s meeting and end it on time!! Next regular meeting is on Oct 3rd at Hatoba Kaikan. See you then! As contest chair I have enjoyed a very good experience. This time, I tried to communicate with the contest SAA by using a mobile phone. It was very convenient to call the contestants in at the right times. Adding the names to the Participation Certifications and winners to the Award Sheets were made much easier by pasting pre-printed names. 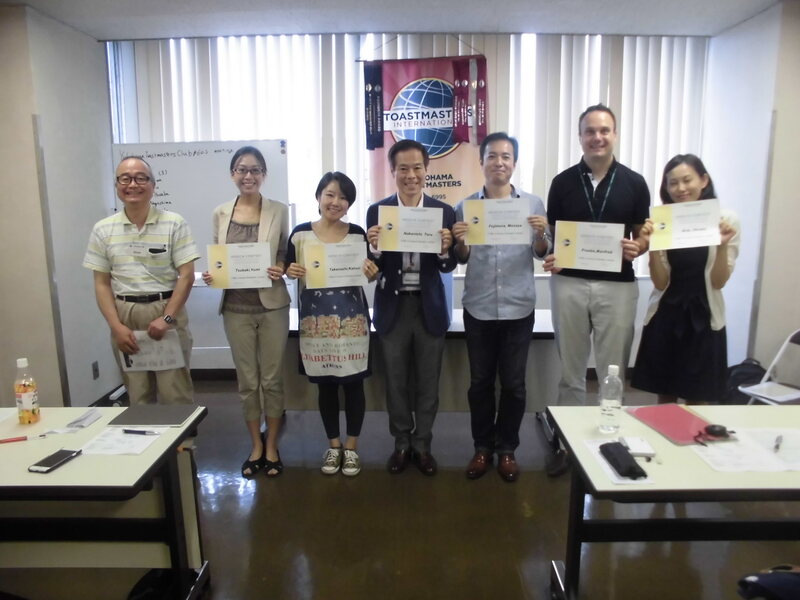 We would like to thank Toastmaster Taketomi as contest SAA., contestants, staff and all participants, thank you very much.